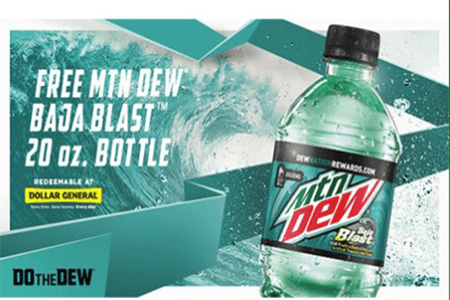 Get a FREE 20 oz MTN DEW Baja Blast at Dollar General! Register for a new account and redeem for the mailed coupon. It’s valid at Dollar General only. This coupon is for new registered users and expires on 5/31/19. Void in AK, DC, HI, ID, MT, WA, and WY.